There's not too much to say about this one. Arsenal have already dug the hole insanely deep, so deep that it does not look very plausible to dig out of it. So, what can you hope for in a match like this? Pride, for one. Any form of victory would be enough to keep the positive league vibes going, even if it meant crashing out of Europe. As far as many are concerned, the crash part has already happened. A 2-1 win, for example, will not nearly be enough to see Arsenal through, but it will be enough to keep the momentum going. After this match, it'll be another six days before Arsenal face Newcastle at the Emirates as they try to keep their league winning streak going, so there will be a little time to rest the regulars between today and then. There'll also be plenty of time for Arsenal's wounded to recover a bit. So today, let's go for a win and hold our heads up high. It'd be nice to rotate the squad just a little bit, but oh man, look at that injury list. Arsenal lost three more players on Saturday, with two more picking up minor knocks. There are 11 players out for sure with injury and two on the doubtful list. In terms of new injury news, Mikel Arteta will be rested after his concussion; he should be back for Newcastle. Abou Diaby returned for the first time since November, made it 20 minutes, then got hurt again; could be 2-3 more weeks for him. Yossi Benayoun is out with an illness (or a hamstring injury, depending on what source you read.) Kieran Gibbs and Tomas Rosicky are both 50/50 with their respective knocks. On the back line, Johan Djourou is still out. So is Sebastien Squillaci. So is Francis Coquelin (he's got at least three weeks to go.) Per Mertesacker's season is still likely done. Andre Santos will likely be back this month. In the midfield, Aaron Ramsey is still a week away. Jack Wilshere is anybody's guess, but Arsenal are optimistic of a return this year. Emmanuel Frimpong's season is over. With seven midfielders out (eight if Rosicky misses,) there are major question marks in the middle. Alex Song will start of course, but with all of the injuries, I think Alex Oxlade-Chamberlain will have to start there too, with Gervinho and Theo Walcott on the wings and Robin van Persie up front. That still leaves you one midfielder short, which will be Rosicky if he's fit or a reserve, by necessity, if he's not. Then again, Arsene Wenger said in his press conference yesterday that the number of injuries might force him to change formations entirely. So, let's see a 3-1-6 formation! Milan still have five of the same long term injuries they had for the first leg, including Alexander Merkel's knee injury, Rodney Strasser following ankle surgery, Gennaro Gattuso's career threatening eye nerve injury, Mathieu Flamini's knee ligament damage, and Antonio Cassano's heart condition. In terms of recent injuries, Clarence Seedorf and Kevin-Prince Boateng have each not played since picking up thigh injuries in the first leg. Maxi Lopez had missed Milan's last two games with a calf injury. Alexandre Pato is out with a thigh injury, as is Alessandro Nesta. He was on the bench in the first leg despite his injury, but he has not made the trip to London. Massimo Ambrosini will serve a one match ban. 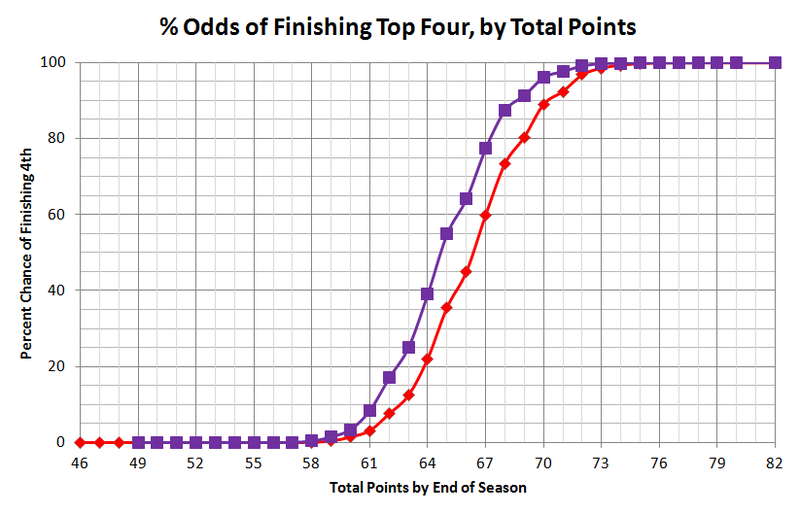 Updated graph of Arsenal's odds of finishing top four. Arsenal have won four straight in the league and are unbeaten in five, truly bolstering their chances at fourth place. Advancing to the quarterfinals looks out of reach for the Gunners, but a victory on home soil would provide a morale boost moving forward, with 11 games to play in the Premier League season. I wrote last week that Arsenal would probably have to win about nine of its last 12 games to take fourth. Chelsea's loss to West Brom makes the task a little easier (the three points dropped by the Blues is nearly equivalent to another Arsenal win, mathematically speaking.) 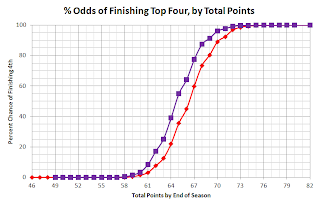 Now, as shown in the graph (the red line is as of last week, the purple line as of today,) Arsenal look like they will need closer to just seven more wins than eight to get the job done. At the Emirates, Arsenal's last three matches across all competitions have seen them outscore their opponents 15-5. That means they would be on pace to win this game 5 to 1 and two thirds... which would not be enough to advance, even if you round down to 5-1. Damn away goals. Since losing to Manchester United in January, Arsenal have beaten Aston Villa in the FA Cup 3-2, Blackburn Rovers 7-1, and Tottenham 5-2. The first and last of those matches saw Arsenal come from behind to score all of their goals unanswered after going down 2-0. As for Milan, they are still riding high. They are unbeaten in five in the league after a 4-0 win away to Palermo at the weekend. Zlatan Ibrahimovic had a hat trick. Milan have not lost a game by more than two goals across all competitions this season. in 2004. Can Arsenal overcome four? Rather than re-hash Arsenal's history with Milan in this space, since it's not much different than it was before the first leg (to recap: Arsenal beat them in 2008, Milan beat Arsenal in the 1994 Super Cup,) let's instead talk about the odds of overturning large deficits in the Champions League. Arsenal have never scored a goal at home against AC Milan, so that's the first thing going against the Gunners in this tie. Only three teams in the history of UEFA competition have overturned a four-goal deficit to win a tie. All three predate the Champions League era. Borussia Monchengladbach is the most recent to do it; they beat Real Madrid 4-0 after losing the first leg 5-1 in the 1986 UEFA Cup. A year before that, FK Partizan overturned a 6-2 deficit with a 4-0 victory over Queens Park Rangers. And, the first occurrence, the 1962 Cup Winners' Cup saw another 6-2 deficit overturned with a 5-0 victory. That time, it was Portuguese side Leixoes who came back against La Chaux-de-Fonds. AC Milan themselves have the distinction of having the largest first leg lead overturned in the Champions League era; that was three goals in 2004. They had won the first leg against Deportivo de La Coruña 4-1 before losing the second leg 4-0. In all of these instances, the team overturning the deficit had at least scored a goal in the first leg; Arsenal cannot say they did that this time around. Damir Skomina's cold death stare. The referee is Damir Skomina from Slovenia. Earlier this year, Skomina took charge of Arsenal's 1-0 win at Marseille, when Aaron Ramsey had the injury time winner. Prior to that match, the only English side to win a match with Skomina as the referee was Fulham, who beat Wolfsburg in the Europa League in 2010. Manchester United (a draw and a loss,) Manchester City (a loss,) Liverpool (a loss,) and Tottenham Hotspur (a loss and a draw) have all had setbacks with Skomina in the middle, while the English national team has three draws and a loss with the Slovenian in charge. Skomina has worked only one AC Milan match in his career, a 2-0 win over Auxerre in 2010. Some of those aforementioned English setbacks with Skomina have been Champions League wins for Italian sides: Liverpool's loss was to Fiorentina, Tottenham's loss was to Inter, City's loss was to Napoli earlier this year. The only Italian Champions League setback with Skomina as the referee was Inter's quarterfinal loss to Schalke last year. Arsenal are not the only side that is currently, to quote the UEFA Web site, staring down the barrel of a gun right now. Benfica trails Zenit St. Petersburg 3-2 heading home today. Howard Webb is the referee for that game. But, that UEFA quote was referring to Bayer Leverkusen, who are down 3-1 to Barcelona and playing at Camp Nou tomorrow. The fourth and final match this week is in Cyprus, as APOEL hosts Lyon, trailing 1-0. Next week, the remaining four ties see their completion. Bayern Munich trails Basel 1-0 heading home to the Allianz Arena. Inter is also heading home trailing 1-0; they'll host Marseille at the San Siro. Both of those matches are next Tuesday. Next Wednesday, the round ends, as Chelsea will try to overcome a 3-1 deficit to Napoli at Stamford Bridge and Real Madrid and CSKA Moscow will try to break a 1-1 stalemate at the Bernabeu.